Just three games into the 2019 season, the Colorado Rockies have already suffered their first setback. New first baseman Daniel Murphy is expected to go on the Injured List in the next day or two with a broken index finger. Murphy will see a hand specialist on Monday, after which the club will have a better timeline on how long he’ll be out. But the Rockies will have to plan to be without Murphy for the early part of the season. Murphy jammed the finger while fielding a ground ball during Friday’s game against the Marlins. He stayed in the game and managed to get a hit a few innings later. However, Murphy could tell that something was wrong, and an X-ray taken on Saturday confirmed that he had broken his index finger. The 33-year-old Murphy was one of Colorado’s only offseason signings. He signed a two-year, $24 million deal with the Rockies over the winter. Murphy was one of the best hitters in baseball in 2016 and 2017 with the Nationals. Last season, he missed the first half of the year while recovering from knee surgery but started to come on strong the second half of the season after being traded to the Cubs. The Rockies were expecting him to be a table-setter toward the top of the lineup, hitting right in front of Nolan Arenado the first two games of the season. However, the Rockies are now going to have to come up with a new plan at first base. Ryan McMahon, who began the season as Colorado’s second baseman, started at first base in place of Murphy on Saturday. The Rockies can also use Mark Reynolds at first base. The 35-year-old won a bench job with Colorado after coming to spring training on a minor league contract. He’s now likely to share first base duties with McMahon until Murphy is ready to return. With McMahon shifting to first base, youngster Garrett Hampson got the start at second base on Saturday. Initially expected to serve as the team’s backup middle infielder, Hampson may get an opportunity for regular playing time early in the season. It’s also possible that top prospect Brendan Rodgers gets called up to play second base if the Rockies want McMahon shifting to first base permanently while Murphy is out. Another option is moving Ian Desmond back to first base and giving Raimel Tapia a chance to play center field regularly. Clearly, the Rockies have a number of options for how to replace Murphy in the lineup. That may be the silver lining of him suffering an injury so early in the season. 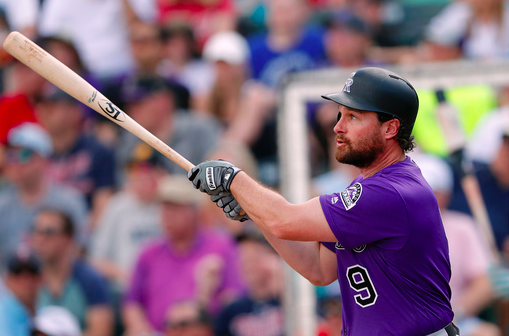 However, Murphy was expected to be a major contributor for the Rockies, and his injury means Colorado will have to depend on younger, unproven players. On top of that, the Rockies are still unsure how long it will take for Murphy to recover and return to the lineup.